1 OWNER WITH CLEAN CARFAX. 2006 CHEVY 1500. 4.3L V6, 5 SPEED MANUAL TRANSMISSION, 8 FT BED, BRAND NEW TIRES, TOW PACKAGE. PERFECT WORK TRUCK. ONLY 75K MILES. 90 DAY/3000 MILE WARRANTY INCLUDED. ALL FOR $6995. EASY FINANCING AVAILABLE $35 PER WEEK AND $0 DOWN. 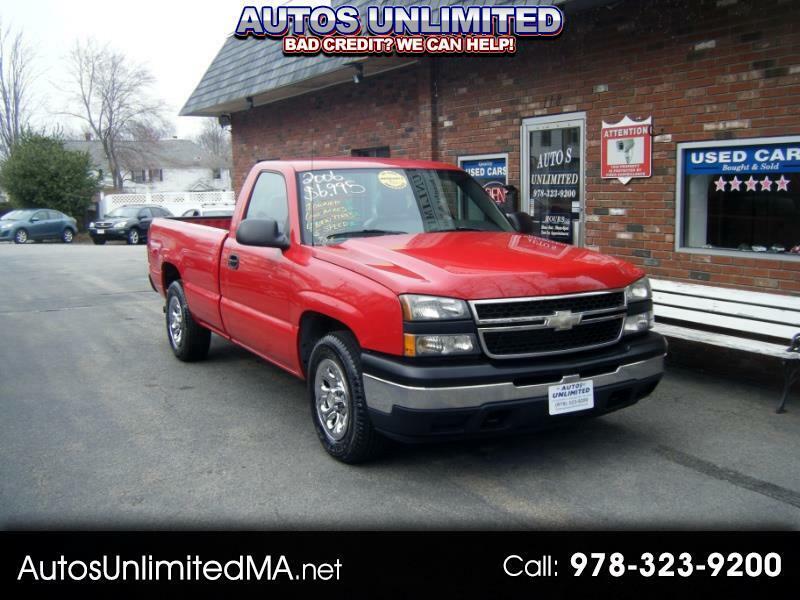 FOR MORE PICTURES, INFO AND TO GET APPROVED TODAY PLEASE VISIT AUTOSUNLIMITEDMA.NET OR CALL AUTOS UNLIMITED 978-323-9200. IF YOU PREFER TEXTING PLEASE TEXT 978-726-4107. THANK YOU.